I find that I turn to tacos more and more. Because the ingredients are cheap (10¢ limes, 38¢ avocados, 48¢ cabbage heads, 29¢ big bunch of fresh cilantro, yo!) and because I know my kiddos will gobble them up…in some form or another. Two will pick out all the parts from inside the taco and eat things one by one…avocado, then pork, then tortilla. One of those two meticulously picked off all the cilantro leaves as well. (He doesn’t know what flavor he’s missing out on!) And then there’s my Charlie who eats whatever you put in front of him, in whatever form you present it. Regardless of how these were eaten, they were a hit. The pork meat was phenomenal and I’ll be make these on a regular basis. Here’s the video I posted on Vine, of loading the slow cooker. Then in the later afternoon, I pulled the meat apart and let it soak for an hour in the lime-cilantro juice in bottom of the slow cooker. Delish, delish. Serve these on flour or corn tortillas…doesn’t matter. A note about the tortillas, I had 3 tacos on corn tortillas because corn tortillas are smaller. I suggest 12 corn tortillas (3 each for 4 people) or 8 soft taco size flour tortillas (2 each for 4 people) in the recipe. Also, a dollop of sour cream would be a great addition. Season the meat with garlic and cumin, salt and pepper. Squeeze the limes over top and add into the slow cooker. Add a little cilantro. Set on low and cook for 8 hours. About an hour before serving, remove the lime halves and shred the meat with 2 forks. Let cook in the juice until ready to serve. Prepare the avocado, cabbage, etc. 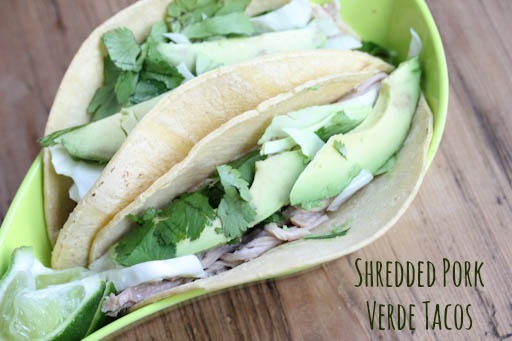 Assemble the tacos by adding some shredded pork, shredded cabbage, slice or two of avocado, some chopped cilantro, salt and pepper into each tortilla. I can’t believe how cheap those ingredients are. Here $1 for avocados and $.25 for a lime are considered good prices. Yes Laura…these ingredients were more expensive when I lived in OH, but here in south Texas they are really cheap year round!